UK Power Networks (UKPN) owns and operates the electricity network in Bucks and delivers our electricity, regardless of who the electricity bill is paid to. This means UKPN are the people to call when there is a power cut, not the electricity provider, as most people believe. UKPN is encouraging all older people to sign up to its free Priority Services Register (PSR), which means they will be offered extra help during a power cut. What sort of extra help is available? 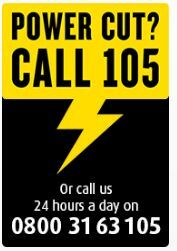 105 is the new number to call if you have a power cut. It’s free of charge and will put you through to your local electricity network operator who can give you help and advice.